Francisco is an Argentinian designer working in Italy. 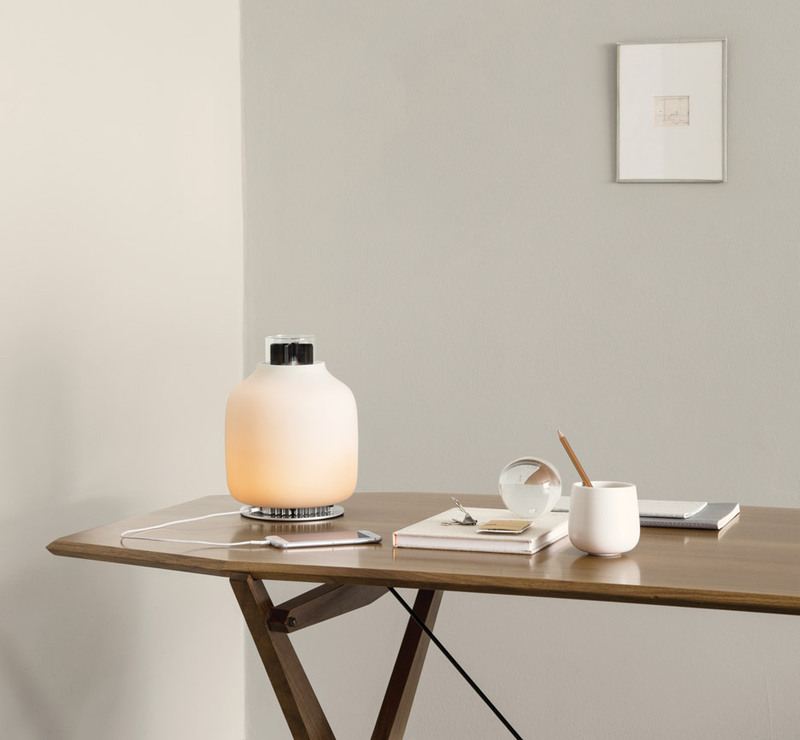 He created the Candela lamp as the first product for the new Danish-Italian lighting brand Astep. He took inspiration from a traditional Scandinavian lantern and scientific technology from the 19th century. The lamp uses a smokeless flame created to generate electricity to power LEDs and charging battery pack that can also be used to charge you phone up. The electricity created is made from the temperature difference created by the flame. It is, at its origin an oil lamp but the heat from the flame is transformed into electricity. The fuel used in this product is bio ethanol which burns clean and is made from fermented corn. The wick is made from ceramic fibres coated in an aluminium powder to insure the wick lasts years. The heat hits a series of plates around the mouth of the cover which pushes heat down to a thermoelectric generator and then into the aluminium base underneath. The two different temperatures creates current through the generator which powers the LEDs. Any surplus energy created is put in a battery cell which can be used as a phone charger. This design fulfills quite a few of the TEN. Design to reduce energy and water use; as it creates its own electricity from heat and uses this to power itself. Design that explores clean/better technologies; at every step of design Francisco has insured the product creates no waste and any excess is used up. Design that takes models from nature and history; the designer began by being inspired by old oil lamps and Scandinavian lanterns. Finally, Design to reduce the need to consume; this product makes its own electricity and therefore doesn’t need a power supply, it also stops people using the mains to charge their phone, instead they plug it into the lamp. For me this is a great example of sustainable design as the lamp needs no electricity, it generates its own power as well as having the surplus to power other devices This means the device does not use up any power made by other means (fossil fuels or power stations) it stands as its own device making its own energy. Anna Winston. (2016). Candela light. Available: http://www.dezeen.com/2016/04/18/candela-light-francisco-gomez-paz-designed-eco-fuel-oil-lamp-electricity-from-heat-leds-phone-charger-astep-milan-design-week/. Last accessed 24th Oct.
Astep . (2015). Candela. Available: http://astep.design/products/candela/. Last accessed 25th Oct.